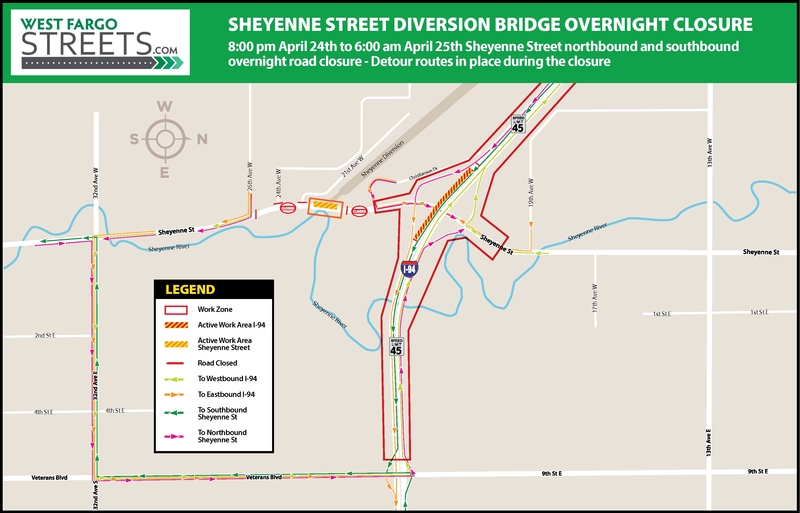 Reconstruction of Sheyenne Street from Beaton Drive to 32nd Avenue to increase roadway capacity from one lane in each direction to three lanes in each direction. Includes installation of traffic signals at major intersections. The project coincides with I-94 interchange reconfiguration project. Open to three lanes of traffic in each direction south of 26th Avenue W.
Open to one lane of traffic in each direction north of 26th Avenue W. and utilize the existing Diversion Bridge. One lane of traffic in each direction will continue through the interchange until Beaton Drive.